In August 2017 Disney World announced the new Fantasmic! 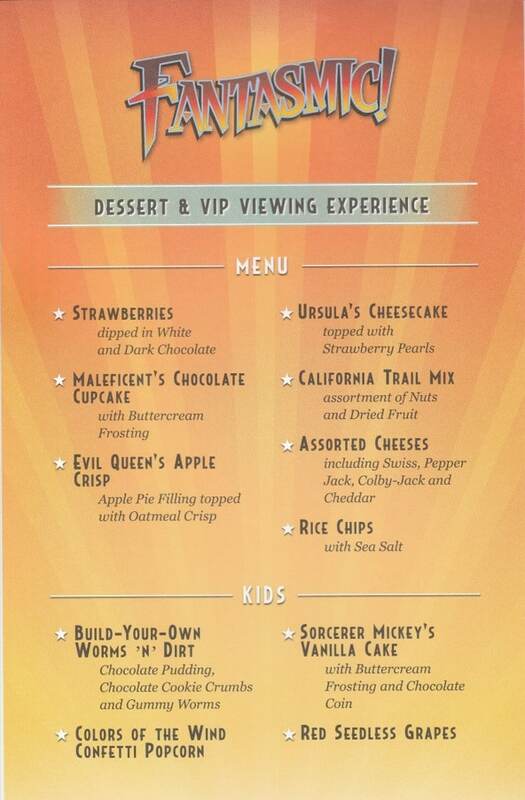 Dessert and VIP Viewing Experience offering. 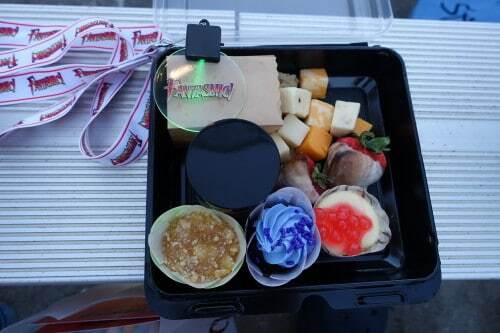 This “Experience” offers some nice snacks, a souvenir mug, and—at least on my visit to it in late September 2017, more on this point below—first come, first served seating in the “Dining Package” reserved area of the Fantasmic! amphitheater. The cost, including tax, is $39 for those ten and older, and $19 for those aged three to nine. Fantasmic! is an evening show at Disney’s Hollywood Studios. Combining a cast of more than 50 people, huge puppets, water effects, live action, projections, and a boat show (well, sorta), it touches on more or less every great Disney animated film through The Lion King and Pocahontas, with a few interludes with more recent characters. 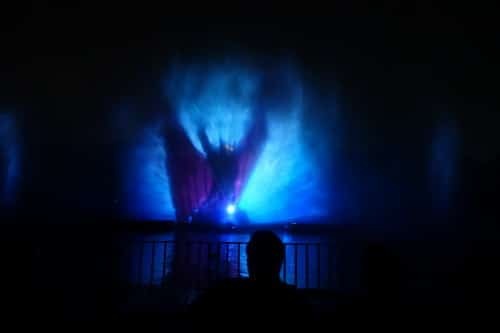 I’ve seen it more than a dozen times, and while it is getting a little old—the projections, on water screens, are particularly in need of both technical and substantive updates—it is among my top five Disney World attractions, and on all of this site’s Disney World itineraries. 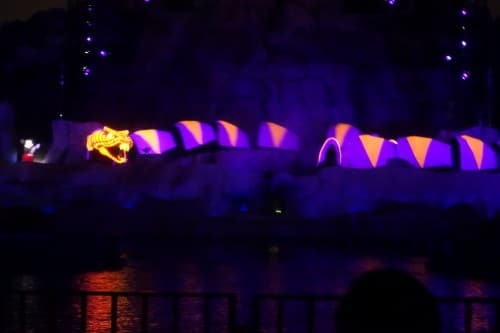 There’s more on Fantasmic! here. Two showings of Fantasmic! a night used to be fairly common, but with the introduction of the new evening show Star Wars: A Galactic Spectacular, one Fantasmic! 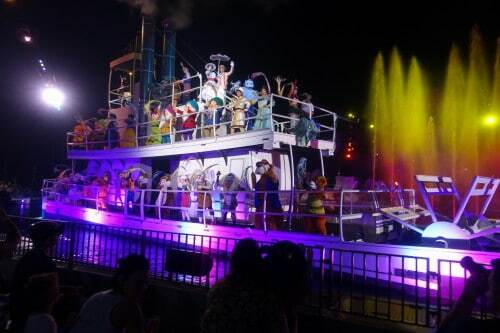 show a night is now much more typical—so it’s not unusual for there to be more people who want to see Fantasmic! than there is capacity. 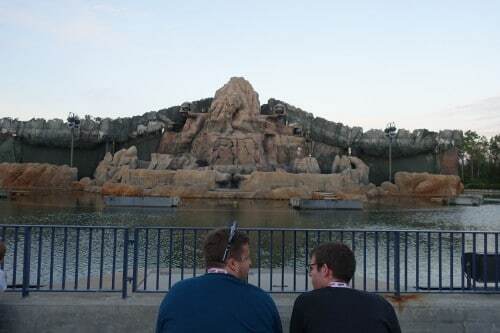 There’s now five ways to get a seat for Fantasmic! Second is to keep looking for Fantasmic! as a 4th, 5th or whatever day-of FastPass+. This works most days, but comes with no guarantee of success. Fourth is to purchase a Fantasmic! Dinner Package at The Hollywood Brown Derby, Mama Melrose, or Hollywood and Vine. Traditionally the problem with this—other than cost—has been the choice of restaurants. The Brown Derby is terrific, but not exactly fun. Mama Melrose is pedestrian. Hollywood and Vine traditionally focused on the Disney Junior characters, which put it right in the wheelhouse of kids for whom Fantasmic! might be too scary (it has lots of villains, including large dragon and serpent puppets). Recently lunch and dinner at Hollywood and Vine has shifted to a more broadly appealing character line-up of Mickey, Minnie, Donald, Daisy, and Goofy, making it a more viable option. But at Hollywood and Vine lunch Fantasmic! package (after tax and tip) is around $63/39 per person, and the dinner package around $70/43. Mama Melrose is a bit less, and Brown Derby much more. The Fantasmic! Dessert and VIP Viewing Experience presents potentially a money and time-saving fifth alternative–to the dining package in particular. At $39 for those ten and older, and $19 for those aged three to nine (tax included, no tip), it is cheaper than a dining package—although not by much–and it saves you the time you would otherwise spend at the sit-down restaurant. The way it works is you make your reservations online here (or of course you can call 407 939-3463). “Dedicated” would seem to mean that you don’t need to arrive early to get good seats. However, on our visit (I went with my imaginary internet friend Steve Bell of MilitaryDisneyTips.com), seating was first-come first served in the Dining Package area of the amphitheater. This matters if you want a specific location. Up close is best for viewing; mid-way gives you an adequate view and avoids the water spray you will get up close; toward the back is best for an easy exit. If there’s not a dedicated seating area on your visit, the earlier you arrive, the more seating choices you will have. If there is a dedicated seating area, then you will be up close, and will get misted. We purposely got up close, as I’d sat pretty much everywhere at Fantasmic! except front and center in the first few rows. Can’t really complain about how close and centered our seats were. And the mist, frankly, was welcome, as it was a hot and humid night. On cooler nights, the mist would be a bug, not a feature. 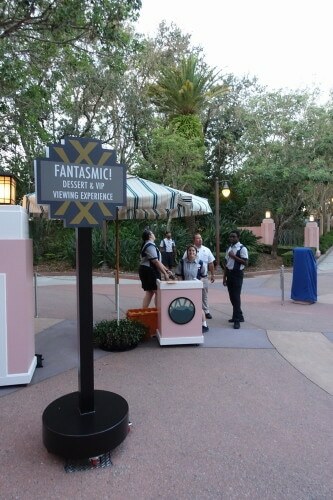 …and a kiosk off to the side. 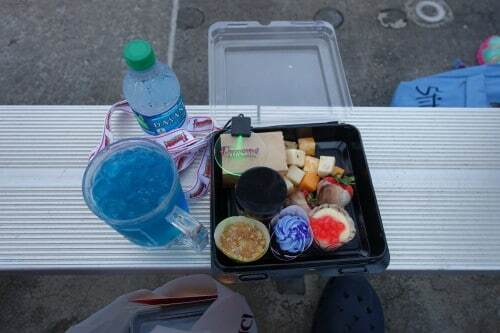 Here you get a lanyard that identifies you to cast members further in as a possessor of this Experience, a drink in a special cup (we got blue margaritas), a small bottle of water, and a boxed set of desserts and savory snacks. Then you go in and sit and drink and snack and wait for the show. There was nothing special about the margarita—there’s also a non-alcoholic punch for the kids, and of course the water bottles—but the mug was fun. It has settings for fast and slow flashing, plus steady lights. The image is of the steady lights. The snack box has both more and better food than I’d expected. The three cupcakey looking things are an apple crisp, cheesecake, and a chocolate cupcake. Each was delightful. The two chocolate-covered strawberries were large and perfectly ripened. The cheese cubes are typical, and in the cute little paper bag are some nice salty tortilla chips. The small jar—you are seeing its lid–includes a trail mix that was the only offering not particularly to my taste, but trail mix preferences do vary (my fave is M&Ms, peanuts, and golden raisins). The menu (click it to enlarge it). In total, while not what you’d call a healthy meal, there’s a fair amount of food here. If you had a heavy lunch, and a snack after, it might substitute for dinner—or come pretty close to doing so. At this price, the Fantasmic! Dessert and VIP Viewing Experience is clearly not for everyone, and is an even worse deal for those whose dining earlier in the day makes the snacks largely superfluous. 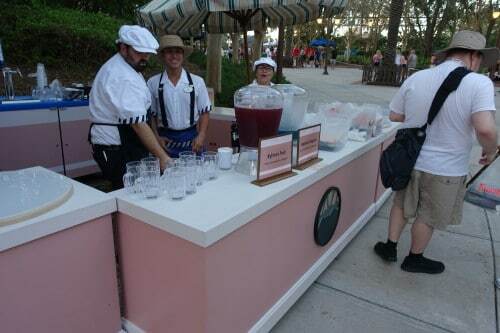 The drink is nice, but no one ever goes to the Studios yearning for a blue margarita. That said, it is a legit approach to seeing Fantasmic! for those who can afford it, especially if the rest of their dining this day lets the snacks substitute for dinner. Hi Dave, just curious, could a TS dining package credit be used for this? We chose the H&V Fantasmic Dinner package (b/c we got the dining plan), as you mention above, but the reservations for dinner are super early. Also, with the dinner package, will there be reserved section(s) for us which we can arrive shortly before, or does it only guarantee admission into the amphitheater? I’d be fine with the worst of the reserved section versus the nose bleeds. Eric, sadly no you can’t use a dining plan credit of any type for this. The dining package seating is the center wedge of the amphitheater, so it includes both up front and nosebleed seats (which some prefer for easy exit.) So yes, if you are aiming at a specific distance from the show, even with the dining package you need to go in early. Thanks Dave! The easy exit is definitely on our mind too. With our kids, going really early and waiting will be difficult. As long as we’re guaranteed to get in, that’s all that matters. Plus, we did the dining plan to max our character meals, so it works. Dessert Party would have been cool too, but no dp credit = no bueno. Hello Dave, I have been doing some research on the Dessert Package and in some of the literature there is mention of “Glow with the Show” ears. Is this something that you received? Or, am I seeing old information? Emily, the mug was, I believe, a glow with the show item. No ears at my visit. What time did you arrive? With the Dessert Package would you expect front and center seats to be available at 7:30 for an 8:30 show? Peter, we arrived 45 minutes before the show. You should be fine!! Would you say the Dinner and show seats of the Dessert and show seats are better? Shannon, they are pretty much the same. I have a 14 year old which I am sure would prefer the kids snack box. Will they allow her to choose? Or is she stuck with the adult version? I just made our reservations for this. They asked about any allergies in the group (we have a peanut allergy and two gluten intolerant). Just curious if you know whether they change the boxes up to accommodate these (which wouldn’t surprise me in the least knowing how well Disney accommodates food issues) or if we’ll be swapping with each other based upon what folks can eat. Not a big deal either way, but it would be nice to know. Carolyn, I’m sorry but I don’t know. But if you let me know after you do it, I can include that info in the review! We just experienced a fantastic show but the dessert was over priced and very ordinary. I would never recommend this. Extremely disappointing. Just as well the show was amazing!! Absolutely perfect review! The strawberries covered in white chocolate were amazing, The dried fruit and nuts cup was … eh, not so amazing. We got a tiny chocolate cupcake, a tiny cheesecake and tiny apple crisp. Also included was a handful of cheese chunks and tortilla chips. 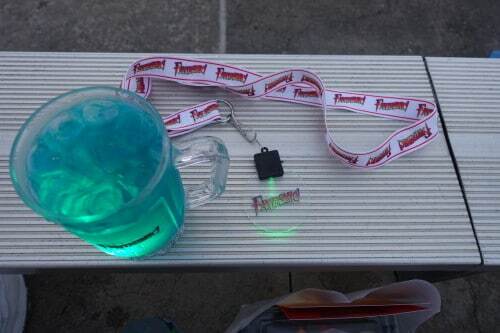 The light up souvenir mugs are so fun! Thanks for giving us a sneak peek. 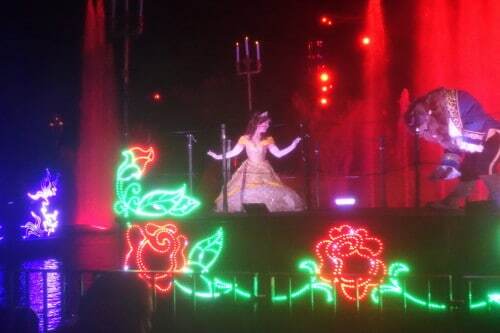 What do you think is better–fantasmic experience or the Jingle Bell one? We are looking to get tickets for one of the dessert experiences. Hi – thanks for the review! 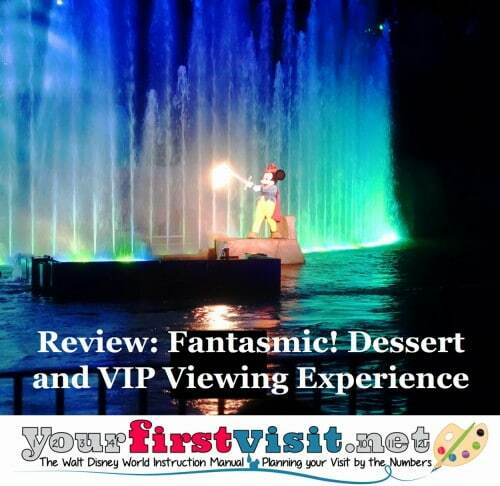 We were able to purchase 7p reservations for the dessert & VIP seating; are we allowed to pick up our box and exit the area and return for the 8p show or do we have to stay in the Fantasmic! Theater for that hour? Thanks! Kati, I think you can, but despite what the tix say, typically the seating is not in fact reserved. So there’s something to be said for grabbing your favorite seats (you will be in the Fantasmic Dining Package section) well before the show starts. What I’d do is not show up right at the beginning of the dessert window, but rather about 35-40 minutes before show start. 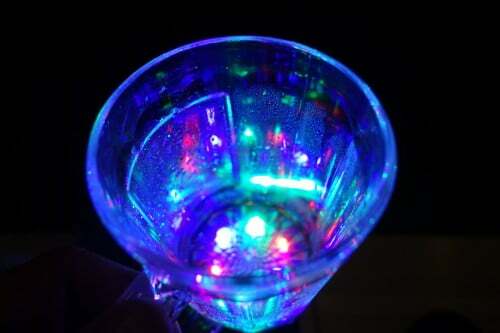 Hi Dave, we bought Glow with the Show mouse ear hats in 2015 and are planning a visit for late 2019. Do you know if the hats will still work? It seems that all of the fireworks will be different except for Fantasmic. The hats worked with that and Wishes and IllumiNations in 2015. 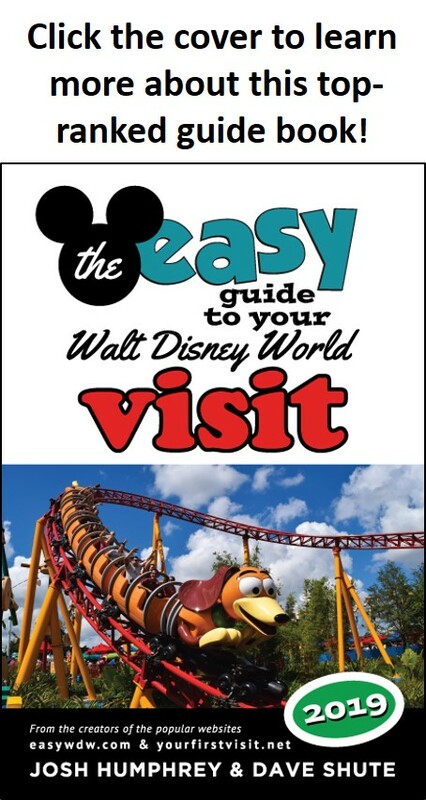 Hey Jane, this page on Disney’s site indicates where they currently work https://disneyworld.disney.go.com/entertainment/made-with-magic/ In the section headed “Entertainment” click the “read more” to open them up. Hi there! I booked the VIP Dessert Experience for my family (we have a 4 year old and 2 year old) and the only time slot available was 6:50pm. Crossing my fingers for an early show time that day.. but if its only at 9pm… can you show up closer to the 9pm showtime instead of our 6:50pm reservation time? Waiting for 2 hours with two toddlers does not sound enjoyable. I’d rather not go 🙂 Would love to know if you know this… I haven’t had any luck finding a review with this same scenario. Jennifer, when I checked in it was to a name on a printed list, but that was a while ago. You probably also got an emailed receipt–I’d print and bring that just in case. Plus having your phone with you, charged, and with the MDE app up can’t hurt!